Discussion in 'PatsFans.com - Patriots Fan Forum' started by MrTibbs, Feb 11, 2019. That's an hour of my life I did NOT waste. This was like 100x better than Mic'D up and Inside the NFL. Combination of insightful sound bytes and fantastic Xs and Os. Oh man! I haven’t watched it yet. Looking forward to it. I saw SBB post it in another thread, and I didn’t realize that it was the whole hour long version. So excited right now. The breakdown of the missed Cooks TD and the change of offense before the TD were amazing. Anyone know if it will be broadcast again? I can't stop watching. I've watched the game 3 times and each of these shows twice. Going to start all 6 soon but I keep going back to this one for now. Why? Looking to DVR it for posterity? If just to watch on a big screen...Don't have a Chromecast, Fire Stick, or TV with YouTube? Heck, most cable boxes have YouTube. Sure, I have Chromecast. Just prefer to stick it on the DVR if I can. Yeah I'm old. Get off my lawn!! Edelman: It was a long year man, I appreciate ya coach. Bill: Man it was, I appreciate you too buddy. Edelman: I appreciated the year. Through the downs and everything man, you were - the way you treated me through that whole thing, it was awesome. Like a fatherly friend. Bill: You earned it buddy, you earned it. Guessing they're referring to the suspension? 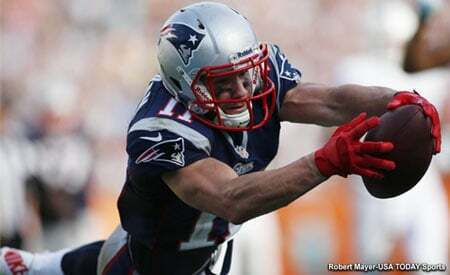 Thought Edelman had a pretty good year once he was back! The Xs and Os were top notch. I loved this show. Best of all of them. One of my favorite moments came when Brady was asked about the success of the team. Brady: It's not one thing. It's every thing. Loved this one. Have seen this, Mic'd up and Inside the NFL. All saved to my favorites on Youtube. Now gimme my SB 53 DVD and my 3GTG6 DVD. Can never watch this stuff too many times. When we win the SB, I'm watching this stuff almost daily ! Watching the draft prospects videos on Youtube as well, NO DAYS OFF ! BB seemed very hesitant about sending Gost out for the FG. Not a good sign moving forward for Gost. Mentioned it in the other thread. Cracked me up when after the LAR FG the head ref want over to Hightower and said "Three to three? What the hell??" and Hightower replied "Yeah, crazy! Right?" And in addition to America's Game, will NFL Network do the bonus hour on the Pats in Do Your Job part 3 or whatever it will be?